The content security team is pleased to announce a series of updates to the Barracuda Web Security Gateway (WSG) product line. The details are in this press release. The Barracuda WSG provides comprehensive web security and management. It offers dozens of features and benefits including spyware and virus protection, application control, content filtering, Barracuda Advanced Threat Detection, and more. There are several models to choose from, and it's available as a physical or virtual appliance. One of the updates announced today is improved SSL scanning performance, powered by built-in SSL acceleration hardware cards on certain models. This technology doubles the performance of SSL Inspection and significantly improves the ability to inspect, secure, regulate, and monitor SSL encrypted web traffic. Another improvement is the integration of Barracuda Advanced Threat Detection. This cloud-based microservice helps detect and protect against ransomware or other targeted attacks. This service can be added to protect online users, without the need to add additional firewall technologies. The Barracuda Chromebook Security Extension is also included in the new Barracuda Web Security Gateway. This extension enables schools to enforce designated Barracuda Web Security Gateway policies on Chromebooks via an easy-to-use browser plugin. Policies can be enforced even when the devices are outside the network, providing security for students whether they are on campus or remote. More details on today's updates can be found in our press release here. 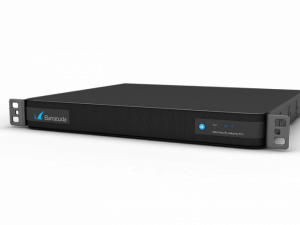 For more information on the Barracuda Web Security Gateway, visit the WSG product site here. Fill out this form to order a risk-free 30-day trial of the WSG.